Fowberry Lucien A SUPREME CHAMPION! Lucien's sire Top Account already has 8 Supreme Champions, 26 Champions, 13 Reserve Champions, 40 1st places and 23 2nd places and that dos'nt include his 2011 show results. Top Account has proven himself as a most influential and prepotent U.K. herdsire. Lucien born on 10th June 2007 is the product of some supremely outstanding genetics and has a full Australian pedigree that contains such evocative names as - Purrumbete Highlander, Inti, Sweet Freedom and Ledgers Dream, also Jolimont Commisario and Benleigh Bellisimo. Lucien has been DNA tested and certified as a working male on the Australian Alpaca Association registry so over your Australian registered females, you have AAA registerable offspring. Lucien is following in the footsteps of his sire Top Account in every way. His first fleece micron of 15.3 at eleven months assures us that he is just as fine as his sire; he has the same incredible brightness from thin staples of fibre displaying a high frequency crimp . He has a really soft handle to his fleece throughout his body, due in part to the lack of medullated fibre and in 2008 all his fleece from bonnet to legs was suitable for quality yarn production. 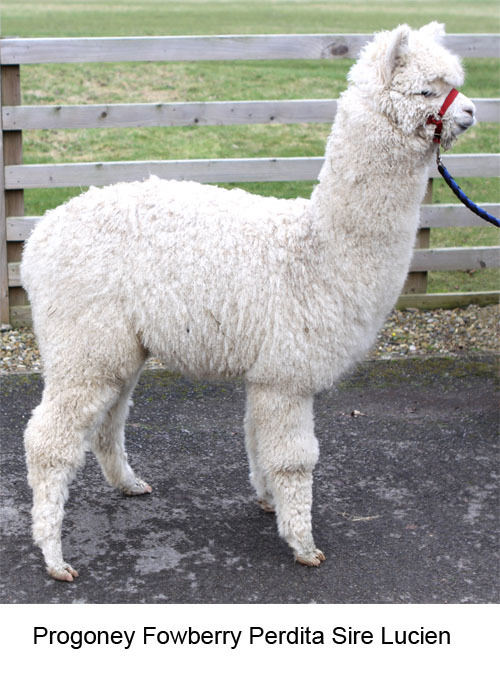 Show judges to date have commented on and appreciated the density on an alpaca as fine as him. During Lucien's first show- The British Alpaca Society National Show, Newark 2009, Lucien was Ist Intermediate White Male and went on to beat a further 28 other Intermediate white males to secure Reserve Intermediate Male Champion. His butter soft fleece, while still exhibiting density was commented on by judges. Northumberland County Show 2009: Lucien was 1st Intermediate White Male, Intermediate Male Champion, Supreme Show Champion and Best White in Show. In 2012 Lucien was looking so good we decided to show him once more a brave decision for a supreme champion. He was entered into the South of England show and took 1st senior white male and reserve colour champion. Lucien's first progeny arrived during 2010 (all female). His cria are the complete package of correct conformation and fleece and have been well received in clients' herds as well. Lucien's first cria have just started entering the show ring. His daughters claimed 1st, 2nd and 3rd junior white females at the 2011 Northumberland County Show, as well as Junior reserve colour champion and colour champion. Now a few more years on Lucien's progeny have grown in numbers and his crias are making their mark in the show ring. The sign of a great herd siire! Lucien is jointly owned with Fowberry alpacas.